Gunung Raya is the highest mountain in Langkawi with an altitude of 881 meters. It is located in central Langkawi and has the sprawling Gunung Raya Golf Course at the base. The mountain is covered with dense rainforest which is full of amazing flora & fauna. The forest reserve spreads over an area of over 5000 hectares. There are two ways you can approach the peak of Gunung Raya. You can either drive or trek. Easiest is to take a rental car or a taxi. You will need to take the narrow winding road Jalan Gunung Raya that starts from a junction with Jalan Ulu Melaka. The road to the peak goes through a dense forest, however the drive is easy as the gradient is not too steep. But watch out for the cars coming from the other side, particularly during the turns. It takes about 25 to 30 minutes to reach the peak by car from the foot hill. Taxis usually take RM60 one way from Pantai Cenang or Kuah. However if you like to trek, there are well known operators who organize nature tours and offer great Trek to explore Gunung Raya rainforest. This is a soft trek. Treks are timed in such a way that you get to see the wildlife during daytime or after dark. In the evening, you can see some unique & amazing nocturnal animals in the rainforest like the flying fox and flying squirrels. During the day time also you can see many animals and bird life like the leaf monkeys, macaque monkeys, eagles like mountain hawk eagles & white bellied sea eagles, great hornbills etc. 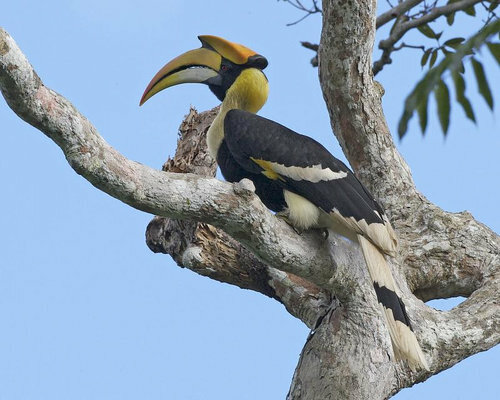 The great hornbills are the largest birds in Langkawi and can measure up to 1.3 meters from the beak to the tail end. As you drive, you won't get much views for most part because of the lush foliage and forests on both sides of the road. However there are look out points on the way, but they are not very well maintained. The drive is however quite scenic and enjoyable. Look for the wildlife as you drive up to the summit. Early in the morning, you are almost guaranteed to see many wildlife and birds. The peak is essentially a granite formation. There is a resort on top known as the D'Coconut Hill Resort. On a clear day, you get awesome panoramic view of the island and the Andaman sea from the peak. There is a watch tower that belongs to the resort but also open to the public. The admission fee to the tower for public is RM10 per person. In order to get the best views, you will need to go to the top of the watch tower. There is an elevator to take you to the top. 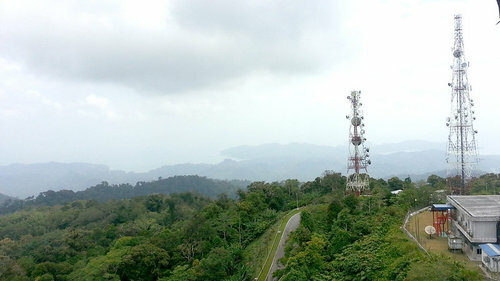 If you haven't made it to the peak of Mount Mat Cingcang by taking the cable car ride from Oriental Village, then the peak of Gunung Raya can give you an equivalent experience to enjoy lovely view of the island and rainforests from top. 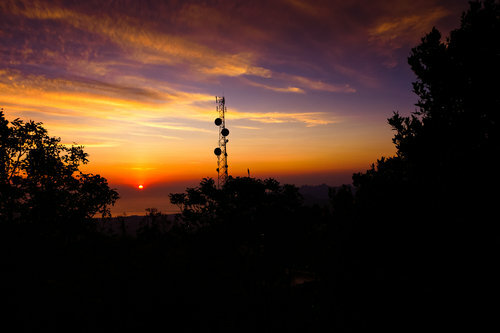 From the top of the tower, you get a 360 degree view of Langkawi, the Andaman sea and even the mainland of Thailand. The resort offers complimentary Chinese Tea which is included in the entry charge. You can relax in the open and have the tea as you enjoy the view from the tower. The sunset view from here is absolutely stunning. If you don't want to spend money for the tower, then you can still get a nice view from close to the resort. However the view is much reduced. On a murky or a cloudy day you won't get much views and there is not much point going to the tower anyway. There are not many facilities at the top. The D'Coconut Hill Resort has couple of restaurants - you can have a relaxing cup of coffee at their Vietnamese restaurant 'Viet Lang', or try out some nice Italian fares like lasagna for lunch at the Italian restaurant 'La Torre'. The resort also has a spa. The peak has a small park and a museum. 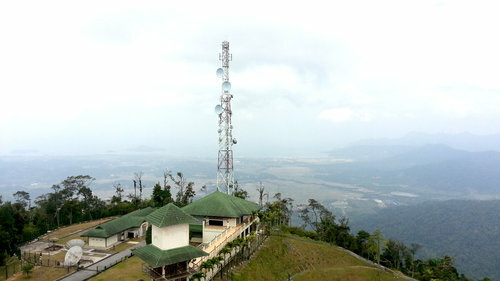 There is a MEASAT Satellite Control Tower at the peak as well. There are no public restrooms at the peak. The natives of Langkawi believe that once there used to be two giants, Mat Raya and Mat Cincang. Mat Raya's daughter and Mat Cincang's son were deeply in love, and the parents who too were great friends decided to get them married. However during the marriage, a fierce brawl broke out between the two giants as Mat Raya noticed Mat Cincang's son eyeing another woman during the wedding ceremony. The two giants started throwing pots and pans towards each other. The legend says that the place where the broken pot fell became known as the village of Belanga Pecah (means broken pot in Malay), the place where the gravy fell became known as Kuah (means gravy), where the hot water fell became known as Air Hangat (meaning hot water, there is actually a natural hot water spring in Air Hangat Village), and the place where the wedding ring dropped became known as Tanjung Cincin (i.e. cape of the ring). As the fight continued, a third and peaceful giant Mat Sawar tried to dissuade the two and amicably settle the matter. And all of a sudden a thunder bolt struck from the sky freezing all the three giants as mountains. Today Mount Mat Cincang which is the second highest peak in Langkawi with an altitude of 710 meters represents the giant Mat Cincang. The highest mountain Gunung Raya represents the giant Mat Gunung. And Bukit Sagar is the smaller giant Mat Sawar stands in between the two as if trying to separate them.